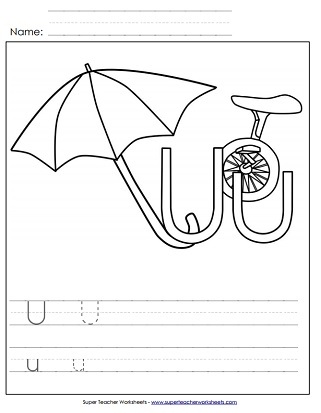 Trace and print the letter U and then color in the picture of umbrella and unicycle. Students will enjoy coloring the pictures of an umbrella, unicorn, and unicycle before assembling and wearing this hat. Trace along the dotted lines on this worksheet to practice writing lower-case u. This is a great worksheet to learn how to write lower-case u. 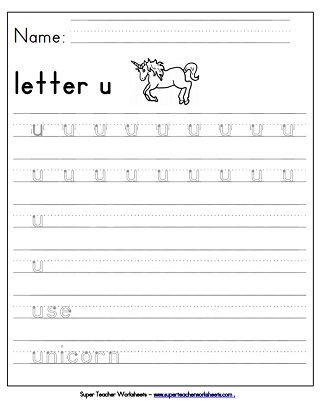 Print this worksheet to practice writing capital letter U. Use a pencil to trace along the gray lines to practice writing capital letter U. Find the letter U u, write the letter U u, write words that start with u, and then draw a picture of something that starts with u. This worksheet is great at helping students practice letter recognition. Dot the circles with an ink dabber in the shape of letter U.